TOKYO (July 30, 2015) — Some stories are timeless and unforgettable; others are easily forgotten. But the vital lessons of the friendship between Jack Twyman and Maurice Stokes ought to be told again and again for generations to come. It’s a powerful reminder of friendship and kindness and common decency and profound courage. It’s a story that transcends racial barriers. Stokes (left) and Roy Campanella (right) became friends following accidents less than two months apart in early 1958 that left both sports stars paralyzed. Campanella was a three-time National League Most Valuable Player as a catcher with the Brooklyn Dodgers. 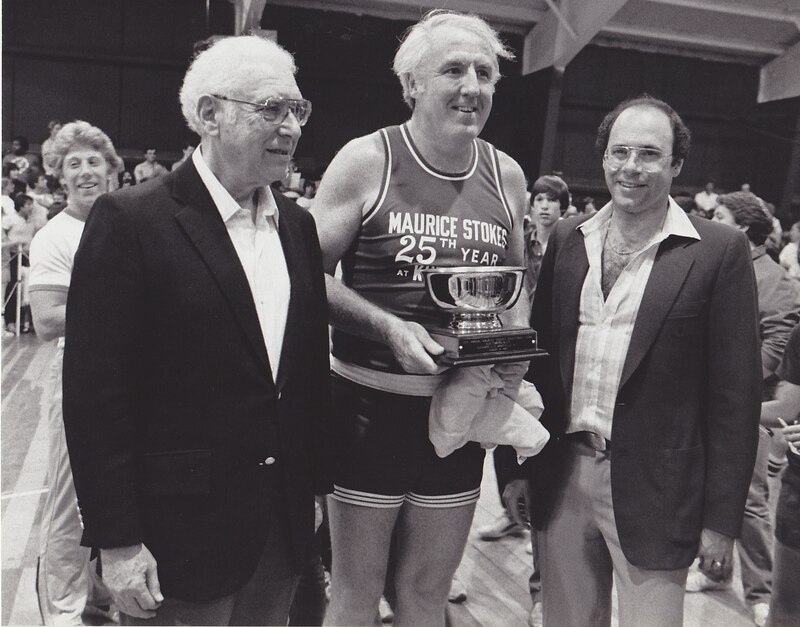 He and Maurice are seen here at one of the Stokes Benefit Games at Kutsher’s Resort. 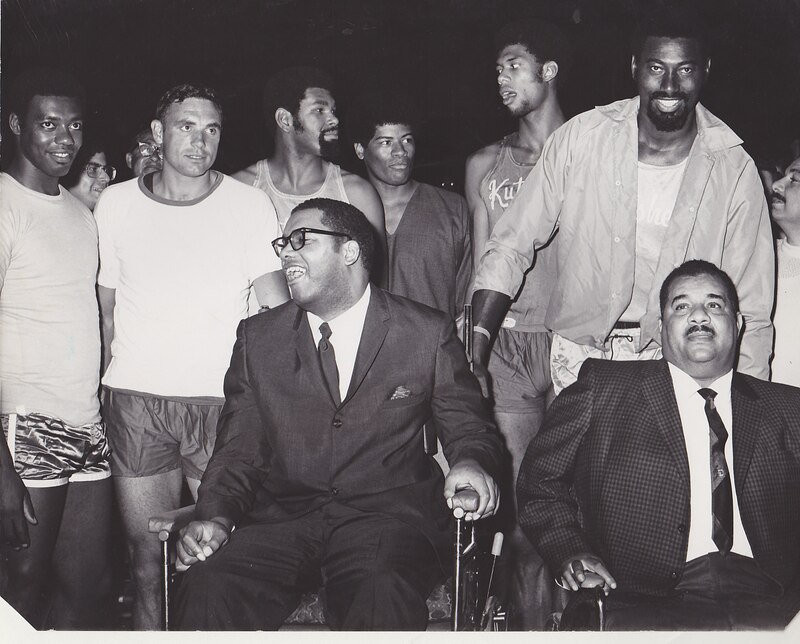 In the back row, left to right, are NBA stars Oscar Robertson, Dave DeBusschere, Gus Johnson, Wes Unseld, Kareem Abdul-Jabbar and Wilt Chamberlain (Saint Francis University Marketing and Public Relations). Milton Kutsher (left) hosted the “Stokes Benefit Game” at his resort in the Catskills each August from 1959 to 1999. Kutsher reached out to Twyman (center) in late 1958 and asked how he could help Maurice. Kutsher’s son, Mark Kutsher (right), continued this tradition after his father died. Following Stokes’ death in 1970, proceeds from the benefit game went to NBA players who needed financial help because of an unforeseen medical crisis (Saint Francis University Marketing and Public Relations). 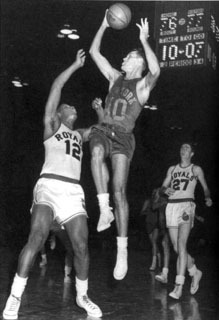 Stokes defends against the New York Knicks’ Mel Hutchins during a game in 1958. Jack Twyman is trailing the play (Courtesy of Jay Twyman). By all accounts, Stokes was a rising star. Entering the NBA out of Saint Francis (Pa.) College, the 6-foot-7 forward was the second overall pick in the 1955 draft. He joined the Rochester Royals and earned Rookie of the Year honors. Twyman also joined the Royals in 1955 as a second-round draft pick out of the University of Cincinnati. He went on to play 11 seasons with the franchise, first in Rochester, then in Cincinnati. He was a six-time All-Star and a 1983 inductee into the Naismith Memorial Basketball Hall of Fame. While Twyman had longevity in the pros, Stokes, over three seasons, just three seasons, was a three-time All-Star and led all players in the fledgling circuit in rebounds (3,492) in that span. His career totals: 16.4 points, 17.3 rebounds and 5.3 assists. He was named to the All-NBA second team three teams. And he was on the verge of being one of the all-time greats. What cut short Stokes’ career? He hit his head on the court and became unconscious in the final game of the 1957-58 season. Days later, after the playoffs had begun and he kept playing, Stokes got sick, suffering seizures while on an airplane flight following a postseason game against the Pistons. He went into a coma and was later diagnosed as having post-traumatic encephalopathy, a brain injury that left him permanently paralyzed. In a June 2013 article posted on ESPN.com, Curtis Harris summarized the plight that Stokes faced and how Twyman stepped in to help his teammate. Harris wrote, “The Royals were obscenely quick to remove Maurice and his $20,000 salary from their payroll. There was no pension or medical plan for NBA players back then, which left Stokes and his family unable to endure medical bills that would approach $100,000 a year. Facing financial peril, Stokes was saved by his Royals teammate Jack Twyman. The hot-shot small forward filled a void few would, and he did so for the duration of Maurice’s life. Indeed. Twyman spearheaded efforts to raise funds to pay for Stokes’ medical bills and other expenses for the rest of his life. In 1958, Twyman and Milton Kutsher put together the Maurice Stokes Memorial Basketball Game, which became an annual event. Twyman died in May 2012 at age 78. In June 2013, the NBA established the Twyman-Stokes Teammate of the Year Award, an appropriate way to keep their legacy current. I recently interviewed Farabaugh, an associate professor of communications and football play-by-play announcer at Saint Francis University, about his aforementioned book about Twyman and Stokes via email. I wanted to gain a broad perspective on his project and learn about the stories behind the stories, as well as his overall thoughts on this book, which is a valuable addition to sports and American history. First of all, what prompted you to write this book? Was it a suggestion from a university colleague? Was it a project you decided to do based on your own intellectual curiosity? Was it in the back of your mind for some time because of Stokes’ association with the university? I served as sports information director at Saint Francis from 1999 to 2005. Stokes was inducted into the Naismith Basketball Hall of Fame in 2004 and we retired his jersey number 26 at Saint Francis in 2000. At these events, I had the opportunity to talk to Twyman and the idea for a book project on the two men began to form following these conversations with Jack. It was such a fascinating story and it had been well-documented by newspapers and magazines back in the 1960s, but now it was largely forgotten, plus no one had written a book that told the entire story. A friend of mine – Vince Negherbon – also served as a catalyst to write the book. During my time as SID at Saint Francis, I became close with Father Vince. Vince is almost as much of a legend at the school as Stokes. He graduated from Saint Francis in 1943 and stayed to pursue theological coursework, eventually becoming a priest. He was appointed the College’s librarian in 1947. This was the first of several roles he served at the school over the next half century, including Dean of Students, Academic Dean, Executive Vice President and Vice President for College Relations. In 1966, Vince became president of Saint Francis, serving in this capacity until 1972. He was also a diehard sports fan. And he loved basketball. During the 1950s, he served as the Saint Francis basketball team’s chaplain. And a driver in the team’s carpool to away games. And a de-facto assistant to head coach Skip Hughes. Father Vince got to know Stokes well during Maurice’s four seasons in Loretto. Years later, he asked Maurice if he would allow the school to name its new athletics facility after him. In April of 1970, Vince presided over Stokes’ funeral mass. He and I became close friends during my time as SID at Saint Francis and he shared stories with me about the Stokes Era at the school. In 2008, Father Vince died at the age of 87. I thought back to all the stories he had shared with me and kicked myself for never having written anything down. This also motivated me to share the story of Stokes and Twyman. Was St. Johann Press the first publisher you pitched this book to? Was it difficult to convince SJP to approve the project? No. I pitched the book to a number of different academic and commercial publishers before signing a contract with St. Johann Press. I had some interest on both fronts, but no offers. I remember it was a Friday afternoon during the dead of winter and I was doing a Google search of publishers and I happened upon St. Johann Press. I had cold-called some other publishers without much success, but I called the number for this publishing house and, moments later, I was sharing information about my book with the owner, Dave Biesel. Dave was interested – he was a sports fan and knew about the Stokes-Twyman story. He asked me to send him some more information about the book, so I sent him what I had written up to that point. Shortly after our phone conversation, I traveled to the Dominican Republic on a mission trip. When I got back, I had a message from Dave saying that he liked what he had read and wanted to publish the book. I really liked some of the ideas he had regarding the book – they were in line with what I was thinking. My instincts told me that this was a good fit. They proved to be right. Since the book’s release last year, how has it been received? What kind of feedback have you been given? Reviews of the book have been very positive. It has been written about in a lot of newspapers and magazines, as well as on-line sites. The Altoona Mirror, Cincinnati Enquirer, Cincinnati Herald, Johnstown Magazine, Johnstown Tribune-Democrat, Mainline Newspapers, Pittsburgh Courier, Pittsburgh Sports Report, UC Magazine (University of Cincinnati Alumni Magazine) and others have written about the book and I was very happy with these reviews. Readers have also reviewed the book on-line (Amazon, Goodreads, etc) and these have been positive, too. I have done a number of book signings and presentations, including one at the University of Cincinnati last November. Amazingly, the first game following the book’s release for both the Saint Francis and University of Cincinnati basketball teams – Stokes and Twyman’s alma maters – was against each other. The two teams played each other to open the 2014-15 season. Prior to this game – which was at Cincinnati – I did a book signing in the Twyman Lounge at UC’s Lindner Athletic Center. Some of Jack’s family stopped by and it was really special. People that I talk to – at presentations and in one-on-one conversations – are amazed at the selflessness of Twyman. Many of them are just floored that a young man with so many other responsibilities would step up in such a huge way for someone. And then honor that commitment for so many years. And they are equally impressed by Stokes’ approach to his life following the accident. Twyman’s selflessness and Stokes’ perseverance in the face of all his physical challenges are the two things that stick with most readers. Is the timing of your next book (“Strike Three: The 1977 Johnstown Flood”) specifically planned to coincide with its 30th anniversary? That’s the plan. I have LOTS of work to do before then, but I am hoping to release the book right around the anniversary of this event. What were the interviews with Twyman like in the summer of 2011? Were there many emotional highs and lows for you and for him? Where did you meet him? Can you describe these interview sessions? Were they real straight forward journalism-style Q&A sessions? About how many hours and sessions were there? After all of those interviews, did your impression of him change at all? Was he essentially the person you felt he was going into the book project? These interview sessions were a lot of fun. The first time I told Jack that I wanted to write a book about his relationship with Maurice, he told me that the book should be about Stokes, and not about him. I told him it would be impossible to share the full story of Stokes without explaining to readers all that he had done for Maurice. He was initially leery about the idea. He thought about it for a while and then told me that he would participate in the project because he wanted more people to learn about the person Stokes was. Jack constantly dismissed all those who were quick to praise his efforts on behalf of Maurice. He always said something like, “anyone else in a similar situation would have done the same thing.” Which, of course, is not true. Our conversations – most of which were over the telephone – were pretty much storytelling sessions. Was it emotional? Yeah, at times it was. I remember when Jack was telling me the story of when Father Vince came to his home in Cincinnati to ask Maurice if Saint Francis could name its new fieldhouse after him. Jack got choked up telling that story. Vince hid in the basement of Jack’s home and they surprised Maurice after Jack picked him up at the hospital. When Vince asked Maurice if he would consent to his name being given to the new fieldhouse, Stokes started crying. They were definitely not traditional, journalistic question-and-answer sessions. I sort of steered the interviews and gave Jack a lot of latitude to take our conversations in all sorts of different directions. In terms of hours and number of interview sessions, that’s hard to say. Some of our conversations were long, some were short, some were interrupted by things that came up for me or him, and sometimes we played phone tag. Going into the interviews, I was already a bit in awe of the person Jack was, because of all I knew about what he had done for Stokes. After talking to him during our interviews, I had even greater respect for him. Twyman is a no-nonsense kind of guy. His work ethic and commitment to everything that he took on life is probably what I appreciated much more following our conversations. When this man set his mind to something, he did not rest until he achieved his goal. And when he gave his word, you could take it to the bank. Jack gave his word to Maurice and the Stokes family that he would look after his friend, and he never wavered from this responsibility. How has learning about the friendship between Twyman and Stokes enriched your own life? Has it given you a greater appreciation for friendships and family bonds? I have learned so much from these two men, but two “life lessons” stand out above the others. From Maurice, I learned that things in life can change very quickly and we can’t control a lot of this. What we can control, however, is the attitude that we decide to adopt when facing life’s challenges. Despite his paralysis and loss of independence and everything else that went along with the last 12 years of Stokes’ life, Maurice’s attitude was upbeat and positive and almost unbelievable. He didn’t wallow in self-pity and simply “wait out” the years that he was confined to Cincinnati hospitals. He lived his life to the fullest and grew as a person and worked to improve his limited mobility and speech and made an impression on the people he met. He never gave up. His perseverance is awe-inspiring. From Twyman – and I touched on this earlier – I learned that hard work produces results and that giving to others is a blessing that we all should cherish. Jack succeeded at everything he put his mind to because he worked and worked and worked to see things through. This is a guy who was cut from his Central Catholic High School basketball team as a freshman, as a sophomore, and as a junior. He is now in the Naismith Hall of Fame. This is a guy who excelled in basketball, in business, in broadcasting, but more importantly, as a father and as a husband and as a human being. And certainly as a friend. From your interview with the Cincinnati Herald, does this poignant statement (“Sure, it’s a basketball story, but it is so much more than that,” he said. “At its essence, it is the story of two men – one who overcame tremendous challenges and another who embodied selflessness.”) remind you of other highly visible friendships chronicled in popular culture in recent years? I can’t think of any recent friendships that have been highlighted by the media that come close to the levels of love and sacrifice and stick-to-it-tiveness of the Stokes-Twyman story. What does the friendship of Maurice Stokes and Jack Twyman, when the Civil Rights movement was underway, tell us about how American society can and should be? This story certainly transcends race, but it is important to appreciate the state of race relations in the country during the period in which Stokes and Twyman’s relationship evolved. It was not until 1954 – when Stokes and Twyman were still in college – that the U.S. Supreme Court ordered the integration of the nation’s public schools in Brown vs. Board of Education. The Stokes-Twyman story was a beacon of light shining from the sports world during the tumult of the Civil Rights era. Twyman served as a role model for all Americans – in Jack, we have a man’s whose vision of the world was truly colorblind. During a decade of upheaval, one in which Americans grappled to determine what the “proper” relationship between blacks and whites should be, all Twyman saw was a friend and teammate who needed his help. And he never wavered. How can their friendship be an important learning tool for American society at a time when rampant gun violence, police shootings of unarmed blacks and a symbol of hatred (Confederate flag) are in the public spotlight? Racism stubbornly persists in American society. It’s like a weed that you pull out of your garden – but before it comes out altogether, it breaks off. You don’t get the roots, and that weed is out of sight for a little while, but soon it grows back because the root system is still intact. Anyone who thinks we are living in a “postracial society” just needs to move that dirt a little to see the roots of the weed. We have seen these roots over the last year in some of the events that you mention. What we can learn from Stokes and Twyman’s friendship is that we do not need to be afraid of those who are different from us – in race, ethnicity, religion, sexual orientation or whatever. That fear keeps us from growing and learning and understanding. Although Kutsher’s Hotel and Country Club in the Catskills, in upstate New York, location of the annual summer fundraisers for Stokes is now closed, can you share a few memorable anecdotes about people you spoke to from the upstate New York resort area? I interviewed Mark Kutsher, who was a child when his mother and father hosted the Stokes Benefit Game at the family’s country club each summer. My interview with Mark was really special because he was talking about all of these legendary players visiting his family’s resort. He recalled meeting the NBA’s biggest stars when he was a kid and he had a childlike enthusiasm when he was describing these experiences to me. And I understood exactly where he was coming from. When Stokes was inducted into the Naismith Hall of Fame in 2004, I attended a reception before the induction ceremony and I was a 30-something kid in awe, meeting and chatting with my childhood heroes – James Worthy, Dr. J., Moses Malone, Robert Parish. Even though you are an adult, you can be taken back to your childhood. I was taken back on that Hall-of-Fame weekend and I felt like Mark took me back to his childhood years as he shared stories about the Stokes Benefit games at Kutsher’s. What made Jerry Izenberg an ideal choice to write the foreword for your book? And how did that come about? St. Johann Press had published Jerry’s memoirs – “Through My Eyes: A Sports Writer’s 58-Year Journey.” This book came out in 2009. Dave Biesel – the owner of St. Johann Press – knows Jerry pretty well and he suggested that we reach out to him and ask him to write the foreword for my book. I was ecstatic when he agreed to write it. He was indeed the “ideal choice” for this part of the book project. He had covered Stokes, but not only that. He had gotten to know Maurice more than a sportswriter covering a sports figure. The two had struck up a friendship and they enjoyed each other’s company. He knew Maurice well and he had seen the daily challenges and struggles Stokes faced following his accident. Who were a few key sources for the book that may surprise some people because they may not be household names or folks who hold/held the prestigious or most visible jobs in the NBA and college hoops? Two of my favorite interview subjects were not basketball people at all. They were with Maurice’s speech therapist at Good Samaritan Hospital, Sylvia Meek, and with his brother, Terro Stokes Jr.
Sylvia’s ability to recall experiences she had with Stokes during their speech therapy sessions was impressive. These sessions happened more than a half century ago, yet she was quick with details and specifics during our conversations. It was obvious that she had a fondness for Stokes and it was also very apparent that she respected the effort that Maurice had put into their speech therapy sessions. Maurice’s brother, Terro, shared insights from Stokes’ years growing up in Homewood, a community just outside of Pittsburgh. You could hear in his voice just how much his brother meant to him. He also expressed to me how much Twyman meant to the Stokes family. He was at a loss for words as he tried to describe his feelings for all that Jack did for Maurice. After all of the painstaking research that went into writing the book and what you learned along the way, do you agree with this assessment: Twyman remains one of the lesser-known greats to ever play the game? Yes. No question about it. Twyman could score the ball, especially from the corners along the baseline. In 11 NBA seasons, he played in six All-Star games. He finished his career with 15,840 points in 823 games (19.2 per game). He finished runner-up in the league in scoring two times and led the NBA in field goal percentage (45.2 percent) in 1957-58. Twyman ranked 20th on the NBA’s all-time scoring list when he retired. He played in 609 consecutive games before a broken hand sidelined him during the 1963-64 season. This is remarkable – think of the pounding that he took night in and night out as a professional basketball player. Twyman was tough. His best scoring season came in 1959-60, when he averaged 31.2 points per game (2,338 points in 75 games). This was second only to Wilt Chamberlain’s 37.6 points per game that season. Talk about lofty company. Twyman and Chamberlain became the first two players in NBA history to average more than 30 points per game for a season. This is a good trivia question to spring on your friends who think they know NBA history. It was the second straight year that Twyman finished runner-up in the league in scoring – he averaged 25.8 per game (1,857 points in 72 games), second behind Bob Pettit (29.2 per game) in 1958-59. Which players in the NBA over the past quarter century most remind you of Twyman and Stokes from what you’ve seen and heard? Stokes’ combination of scoring, rebounding and passing abilities, combined with his unselfishness and basketball IQ, was something that the NBA had never seen before he got to Rochester in 1955. He was a power forward and ferocious rebounder who could not only finish on the fast break, but also handle the ball in transition. He was the first big man in the league with outstanding passing skills. I think his skill set was most similar to that of Magic Johnson and LeBron James. There are differences, sure, but he could do things that these two can also do. Besides Stokes, the only other player in NBA history to finish in the top three in rebounds and assists for two straight seasons was Chamberlain. I think Twyman’s game was a lot like Paul Pierce in his prime. Like Pierce, he could score in a lot of different ways – from the outside, on the drive, getting to the line. He could also deliver key passes at important moments, although he definitely possessed a “shoot-first” mentality. Thank you for helping publicize this Q&A. Greatly appreciated.